Besides brushing twice a day and flossing daily, you should have your teeth professionally cleaned once during your pregnancy. How does pregnancy affect your mouth? During pregnancy, blood flow increases by about 30 to 50 percent. Your glowing pink cheeks are explained by the higher circulation, and it’s happening all over your body, from your uterus to your gums. One consequence of increased blood flow to your gums is that bacteria living at the gumline get lots of nutrition, and even if you weren’t prone to gum disease before pregnancy, you might notice swollen or tender gums that bleed when you brush. The elevated levels of estrogen and progesterone in your system also contribute to gum sensitivity. This condition is called pregnancy gingivitis, and about 50 percent of all pregnant women will experience it. Another effect of gingivitis during pregnancy is that some women develop growths on their gums called pyogenic granulomas, or “pregnancy tumors.” These are noncancerous growths caused by inflammation -- an immune response to an irritant, in this case plaque, They usually go away after childbirth. Can your oral health affect your baby? Bleeding gums would be a minor nuisance if they had no effect on your pregnancy. But new studies show that gum disease or gingivitis may actually harm your baby’s health. One study found that women with severe gum disease are up to seven times more likely to deliver significantly prematurely -- before 32 weeks -- than women with healthy gums. Another study examined women with gingivitis as well as those with more severe gum disease and found a threefold increase in the risk of delivering before 37 weeks. On the whole, the current studies of gingivitis in pregnancy point to a risk level for prematurity comparable to that of heavy drinking (more than 10 drinks a week) and somewhat higher than most estimates for smoking. Premature babies have a wide range of health problems immediately after birth and often have more long-term complications than full-term babies (born after 37 weeks). Besides delivering early, women with pregnancy gingivitis may also have smaller babies, whether they’re born early or at term. One study found that women with pregnancy gingivitis were more than three times as likely to deliver a low-birthweight baby. This estimate is comparable to the well-documented risk posed by smoking during pregnancy. How can gingivitis lead to premature birth? The current explanation is that when you have gingivitis, the bacteria found in plaque can enter your bloodstream through your mouth. Your body responds to infections or trauma by producing chemicals called prostaglandins, which are also a signal for labor to start. Your immune system produces prostaglandins, which can cause uterine contractions and send you into early labor. Besides brushing twice a day and flossing daily, you should have your teeth professionally cleaned once during your pregnancy. At your visit, be sure to tell the dentist or hygienist that you’re pregnant, or you suspect you might be. If you are diagnosed with gum disease, you might consider asking your dentist or hygienist about a process called scaling and root planing, which scrapes your teeth clean down to the root. In one study, women with gum disease who had their teeth cleaned by this method had a six times lower rate of preterm birth (before 35 weeks, in this case) than women who received only a professional cleaning. Scaling and root planing are a form of deep cleaning that is recommended when plaque pockets are larger than 3 millimeters. After scraping or scaling the plaque at and below the gumline, the base of the tooth is planed, or smoothed, so that it’s harder for plaque to grow again. The second trimester is a good time to schedule a routine visit to your dental professional, but if you're experiencing problems at any time during your pregnancy, see him or her right away. In general, try to avoid major dental treatments while pregnant -- especially during the first trimester, which is the most crucial time in the baby's development. 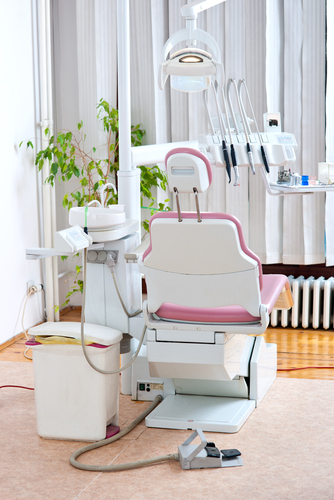 If you have a history of miscarriage or are otherwise concerned, consider talking to your dentist about postponing your nonemergency dental work -- but don’t wait too long for your routine cleaning. By the third trimester, it can be uncomfortable to lie on your back for more than a few minutes at a time. The American Dental Association recommends avoiding routine or elective x-rays during pregnancy. If you absolutely require x-rays, make sure the dentist or technician gives you a leaded collar to protect your thyroid in addition to the regular leaded apron to protect your abdomen.